Sam Briggs is historically fit, that much is without question. But the 2013 World’s Fittest Woman is especially well known for her engine and aptitude at high-rep, conditioning-heavy workouts, fame that’s backed up by seven – yes, SEVEN – world record performances in the CrossFit Open since 2013. Briggs added her seventh record with 16.3, a nasty grip-burning couplet that (as of this writing) put her 12 reps ahead of any other competitor, male or female. The scariest part? 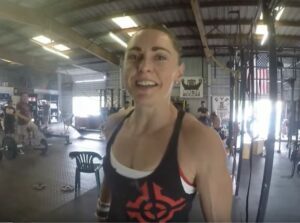 These aren’t even counting her championship performance in the inaugural CrossFit Liftoff in 2015, where she finished first overall and won the conditioning portion of the event by 18 reps over Emily Bridgers. Briggs has also accomplished the rare feat of putting in record performances in back-to-back weeks, which she accomplished in 2013 and 2014. Unsurprisingly, she went on to win the Open both those years. We’ve compiled all seven of Sam Brigg’s top Open performances below for your viewing pleasure. One thing to note: While Briggs is most commonly associated with her ridiculous engine, her wins span a pretty wide time range of workouts. At 34 and coming off a 4th place finish at the 2015 Reebok CrossFit Games, she’s clearly still a force to be reckoned with at every stage of Games competition. Videos courtesy of YouTube users Fireman Sam, WODwell, chloebee19, and Ed W.
What’s the most impressive Open performance you’ve ever seen? Sound off in the comments below.